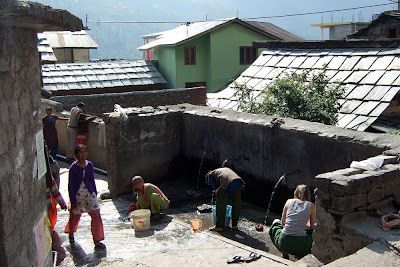 In the town of Vashisht, 3km from Manali, there is a natural hot spring that feeds several public baths. 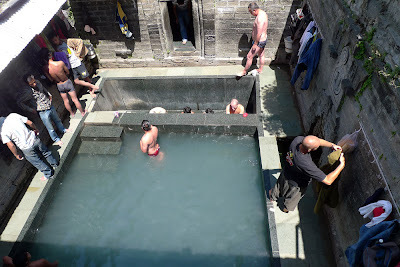 For locals, the baths are part of their daily washing of bodies, clothes, linens, and pots and dishes. For the many Indian domestic tourists, the baths and the adjacent temple are an attraction, in front of which you pose stiffly for family photographs. At first, Andrew and I saved our own cleaning routines for the privacy of our bathroom. This was a big mistake. Once we eventually joined in the hot springs fun, there was no turning back. My first attempt at a group bath was a minor failure. Seeing as Indian women swim in the ocean fully clothed in saris, I figured I should cover up so as not to offend anyone. That first morning, I entered the ladies' bath and quickly stripped down to bikini, with tank top and shorts over top. While submerging myself in the shockingly hot water, straining to avert my eyes, I quickly realized that for the first time in three months, I was the most overdressed woman in the room. Within these four concrete walls (just tall enough so you can't peek in from the road), several generations of Indian women were splashing around, completely naked! I hadn't seen so much as bare knee in months, and suddenly it was the full monty. There were definitely a few giggles about my outfit, but otherwise I was able to slip right into the action, throwing a few elbows for a spot under a spout. From then on, I look forward to the morning bath, and baring all for my fellow sisters. It is the one place in this conservative country that I really feel that I can connect with the Indian women. Without men and clothes to hide behind, my fellow bathers are comfortable, confident and playful. This afternoon, our tightening budget inspired me to queue up for one of the spouts outside the baths to do some self-laundering. A few ladies took an interest and scolded me for my poor scrubbing technique. It was all good fun until I realized the repercussions of having chosen the last spout downstream. A pile of soapy laundry ended up covered in peanut butter chunks when unbeknownst to me a woman started cleaning out PB containers two spouts above me.